Successfully Added Xiaomi Wireless IP Camera - FHD, 1/2.7 Inch CMOS, Wi-Fi, iOS + Android APP, Smoke + CO Detector, Two-Way Audio to your Shopping Cart. Motion Detection, Sound, Smoke, and Carbon Monoxide (CO) Alarm keep your family safe from seen and unseen dangers. 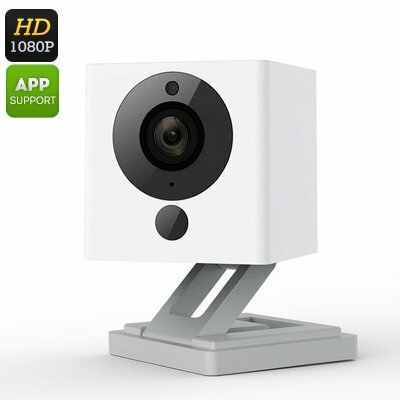 This mini cube shaped IP camera from Xiaomi offers Full HD 1080P resolutions in a compact sized IP camera that measures just 50mm cubed. The unusually shaped mini IP camera has a fold out stand that allows it to be raised, titled and rotated to cover just about any angle. The base has a built in magnet to you can mount it on any metallic surface and with its 110 degree field of view it provides exceptional coverage whether mounted on a wall or sat on a desk. What's more with its compact form and Wi-Fi connectivity you can place it virtually anywhere. A 1/2.7 inch CMOS sensor functions at an F2.0 aperture to brings stunning HD resolutions and picture perfect quality and with 9 meters night vision it can easily identifying any trespassers so makes a great security device. As this IP camera only needs a 5 Volt 1 Amp power input it can be run of a power bank or from the USB port on your computer, with its built in MIC and speaker you'll be able to make use of it for video calls and conferences. With remote access and viewing via a Android and iOS App you will be able to use the camera remotely from you Smartphone or tablet computer, now you can chat with your family or keep an eye on the dog when you're not at home, this brings great reassurance when you have to stop late at the office or spend time away from home. With sound and motion detection the camera will alert you to any disturbances near it and the addition of smoke and carbon monoxide (CO) alarm means that not only can you keep track of your family in real time but you can keep them safe from seen and unseen dangers. This Xiaomi mini wireless IP camera comes with 12 months warranty, brought to you by the leader in electronic devices as well as wholesale IP cameras and security gadgets..